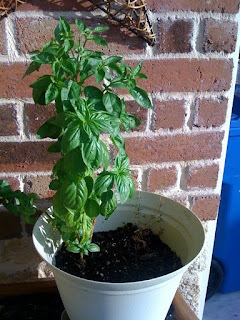 The basil from farmers market seems to be hanging in there. It got a little wilty last week, but it is springing back. It started to bud flowers which is a good sign. Per the instructions that I googled, you are supposed to remove the flowers, so I did. This picture was taken a week ago on 7/16. This picture was taken this morning, 7/23. It's looking alot better. Of course, this pot also had thyme and parsley. The parsley is gone, but the thyme is still there but barely hanging on. 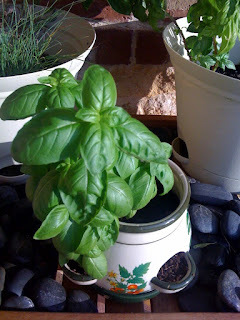 Next time, I will not plant thyme with basil. I think I might plant the thyme in the ground. So, in this pot I originally planted seeds from a buzzy seeds kit. I planted cilantro, chives, parsley, marjoram, basil and thyme. The only thing still alive is the basil. It started wilting last week , but it came back. 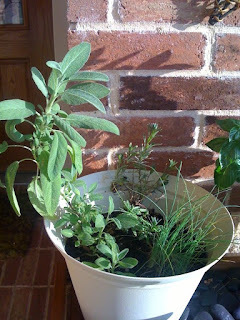 Here are the sage, lavender and chives I bought at Farmers Market. The sage is doing good. The lavender and chives are surviving but haven't made much progress since I planted them 46 days ago. 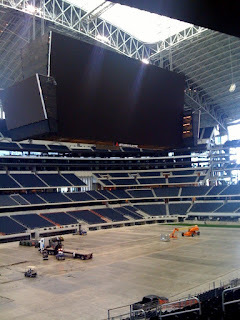 We went to the new Dallas Cowboy Stadium on Tuesday. We got there just in time. It got super crowded very quick. There were 65 people on our tour with us. These pictures were taken with my iPhone. I really need to get a decent camera. The tour started with us sitting in the stadium. This is the view from where we were sitting. 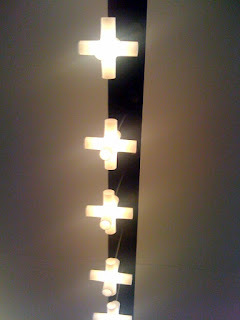 These lights are to resemble the stitches on a football. 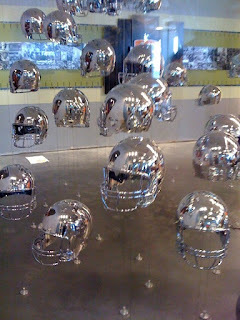 These "floating" helmets remind me of something out of a scene from "Terminator". These can be found in the Cottonbowl Room. 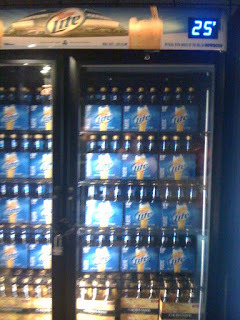 This is in the Miller Lite Club. I think it is extremely important that we see the actual temperature of how cold our beer is AT ALL TIMES. Here's another innovative "As Seen On TV" consumer product. 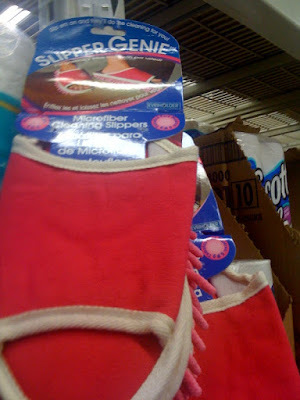 I saw these at Walmart for only $5.96, and tried discreetly to take this picture. All I have to say is "Seriously???" I'd most definitely be GUARANTEED to break another bone wearing these. I'd for sure trip on something. Click on link. You can get a free pastry with a beverage purchase at participating Starbucks on Tuesday, 7/21 until 10:30am. I have guests in from Chicago. 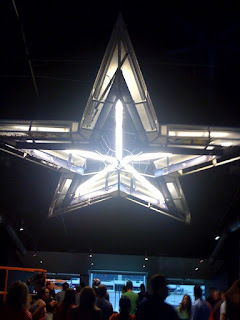 I was feeling so proud to be the "perfect hostess" by taking them to the newest attraction D/FW has to offer. 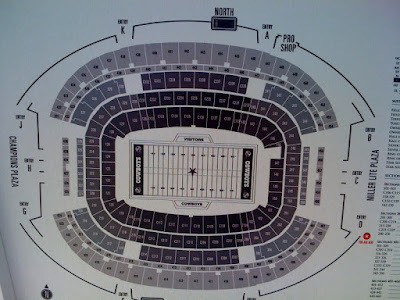 The brand new Dallas Cowboy Stadium in Arlington, TX. We looked online, and you can't book ahead of time - you just show up. Tours start at 10am, and while we did get a late start, thought we had plenty of time. We got there about 11am, and the tours were already SOLD OUT. It was so devastating. My "perfect" hostess hat totally deflated. Of course, we came all that way, so we HAD to shop in the Pro Shop. Surprisedly, prices were not that outrageous. I actually got a tank top that says "I love the Dallas Cowboys" for 9.99, a recycle bag for 1.99, and a plastic beer mug with lights for 12.99. Determined to not lose my "Perfect" hostess card forever, we are going to try to go again on Tuesday morning before my guests head back to Chicago.